The Ministry of Defense of the Russian Federation ordered a series of three Project 23120-class ice-capable logistics support vessels to support multiple mission needs of the Russian Navy. The ships are designed by JSC Spetssudoproekt Design Bureau of St Petersburg and are being built by Russian shipbuilding company Severnaya Verf Shipyard in compliance with the ARC4 ice-class. The Elbrus-class is classified by the Russian Maritime Register of Shipping. They can be used for storage and transportation of dry cargo, fresh water and ammunition to remote coastlines and to other ships in open sea and harbour. They are also suitable for other missions, including search-and-rescue, providing medical support for the crew of vessels in distress, to search for debris or objects at sea, towing, and disaster relief. The Ministry of Defense of the Russian Federation placed an order with Severnaya Verf Shipyard for the construction of three logisticssupport vessels in June 2012. Keel for the lead vessel in the class, Elbrus, was laid in November 2012 and the ship was launched in June 2015. Factory sea trials of the ship commenced in September 2016 and were completed in June 2017, while sea-state trials are expected to be completed by July 2017. Construction on the second vessel, Vsevolod Bobrov, began in 2013. Hull formation of the ship was completed in March 2016 and the launching ceremony took place in November 2016. 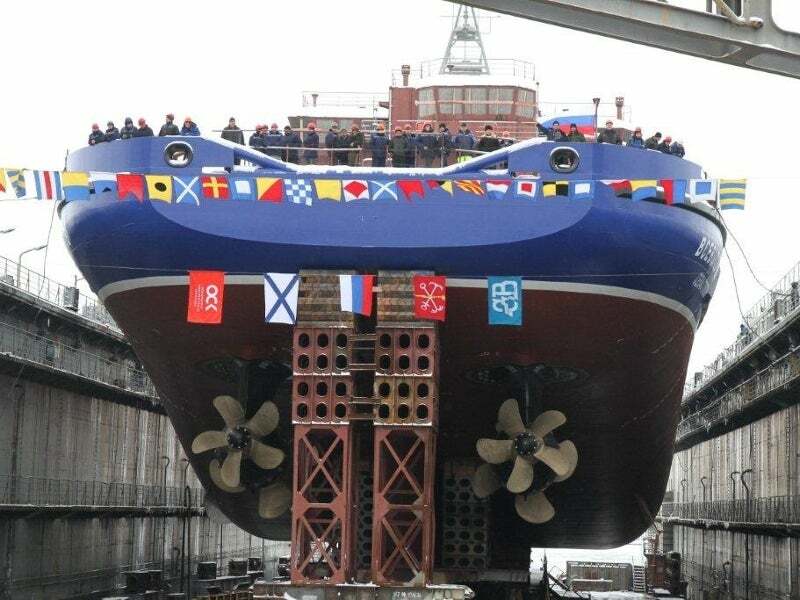 Keel for the third support ship in the class, Captain Shevchenko, was laid in July 2014. The ships will be inducted into the Northern, Black Sea, and Pacific Fleets of the Russian Navy. The Elbrus-class features bulbous bow and ice-strengthened hull, made of steel. Overall length and widths of the ship are 95m and 22m respectively, and the maximum draught is 9m. The vessel can accommodate a crew of 27 people and up to 43 rescuees. With a full displacement of approximately 10,000t, the vessel can load, store and transport payloads weighing 4.5t or up to 40 shipping containers. The 700m² cargo deck can hold approximately 2,000t of cargo. The deck is equipped with two large, collapsible, electro-hydraulic cranes towards the stern to lift cargo weighing up to 50t. It is also outfitted with main and auxiliary towing winches with a pulling capacity of 120t and 25t respectively for towing ships in distress. Two rigid-hulled inflatable boats are housed on port and starboard sides amidships to conduct transportation and rescue missions at sea. The ship is also installed with heating, ventilation and air-conditioning systems, and various mooring and cargo handling equipment. The ship is controlled from the navigation bridge situated on top of the deck towards the bow section. A range of navigation and communication systems are placed on top of the bridge section to ensure safe navigation of the ship in all weather conditions. The systems include X and S-band marine radars for collision avoidance, a search radar, radar transceiver, global positioning system, and a global navigation satellite system (GLONASS). Cryptography techniques are used to provide secure and reliable data communication. Each logistics support ship in the Elbrus-class is powered by four diesel generators that deliver a total power of 17.8MW. They also feature bow-mounted rudder propellers and bow thrusters, which provide high manoeuvrability for the vessel. A dynamic positioning system is installed to maintain the vessel’s position using propellers and thrusters in all weather conditions. The ship can sail at a speed of 18kt in non-Arctic seas and has a cruising range of approximately 5,000nmi and autonomy of two months. It has the ability to navigate through 80cm-thick ice fields at a speed of 2kt in Arctic conditions. SAEM supports the assembly of electric power stations and installation and check-up of large electric motors and machines for many Italian passenger and cargo ships, and all of Italsider's factories in Italy and worldwide.